The Yearbook 's principal aim is to review significant legal developments in international business, and offers an important forum and point of reference for international legal practitioners. Volume 15 continues to develop the inclusion of materials which are of particular value to practitioners and advisers working within the international business sector. 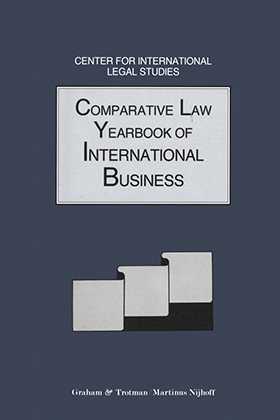 This 1993 volume gathers a range of considerable international expertise to bear upon issues of insolvency administration, rights and remedies of foreign creditors in bankruptcy and insolvency proceedings, enforcement of judgments, product liability in the EC, EC association agreements, commerical agency, environmental regulations, foreign parent corporate liability for subsidiaries, construction contracts, and the International Sale of Goods Convention. From Volume 15, each forthcoming volume of the Yearbook will contain its own Index. In addition a Cumulative Index , starting in 1993, will be published as a separate volume, updated approximately every three years. The Yearbook is published under the auspices of the Center for International Legal Studies, Austria.